Make-Don’t, Fake-Do, or the real deal? Every so often I find a piece that stumps me, stopping me dead in my tracks. This is one such example. 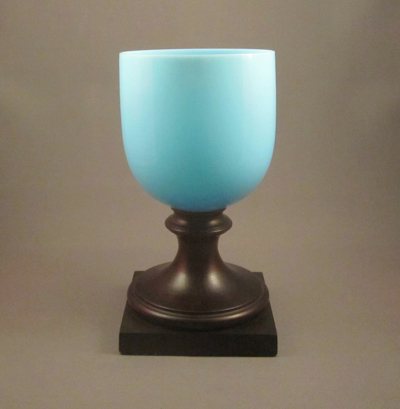 I purchased this 6.5 inch high robin’s egg blue satin glass goblet at an antiques shop in Southern Vermont where I have found other interesting antiques with inventive repairs. At first glance, I believed it to have an at-home wood replacement base repair, similar to dozens of others I own. Upon closer inspection, I am not so sure. Although I have a few examples of finely turned wood bases, this one seems too slick and intentional to be a replacement. The glass itself is in perfect condition, with no indication of its base having been snapped off. 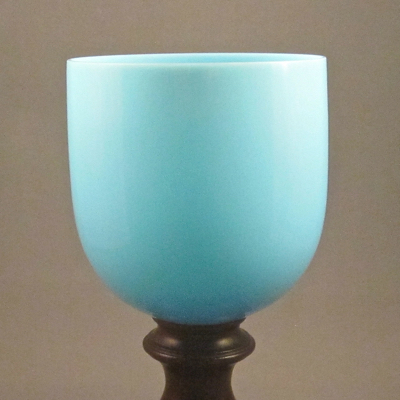 After a bit of research, I believe the goblet to be a reproduction of French Portieux Vallerysthal glass, c.1900. Why it has a wood base is a mystery, but if anyone has any information, I would love to hear from you. 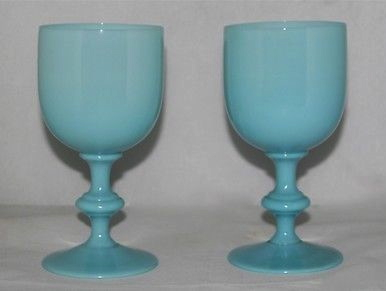 These goblets have their original bases. This entry was posted on Sunday, November 25th, 2018 at 11:00 am and is filed under glass/goblet. You can follow any responses to this entry through the RSS 2.0 feed. You can leave a response, or trackback from your own site. The base looks beautifully turned. Whether it’s been “Frankensteined” or not, it’s well proportioned and weighted nicely. Good wine taste great in any vessel!! Thanks Joy for your insights! This is absolutely incredible. 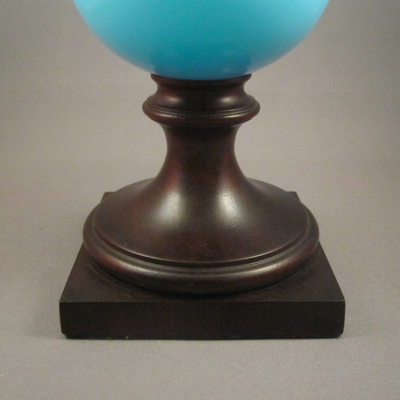 I would consider to know a lot about PV Goblets and all the different types but of course, like you, have NEVER seen one like this. Simply amazing! If I ever come across any, or information in my books, I will let you know. I have a lot of PV Glass books (in French) but have yet to ever see one like you have. Amazing!